I found this book by happy accident while shopping in one of my local indie bookstores. The cover drew me in and the content impressed me too. Can’t you tell from the cover that the little girl has some sass? Ha! The Fourth of July is a very straight-forward holiday for some and complicated for others so I couldn’t pass up a book that features diverse perspectives. In Apple Pie 4th of July, a girl doesn’t understand why her family’s Chinese restaurant/corner store HAS to be open on the 4th of July; no one wants Chinese food on the holiday and she’s missing the parade! Her immigrant parents simply don’t get it. But maybe her parents know something (fireworks ARE from China by the way…) and maybe her holiday will turn out fun in the end! There’s a lot packed into this book. Though she thinks she knows exactly what it means to be American and she underestimates her parents’ understanding of American culture, she learns that their Chinese-ness fits perfectly in. She’s growing up and finding her way. I really enjoyed the writing; I like the way Wong breaks up sentences and spreads them across the pages. The illustrations are beautiful; Chodos-Irvine’s linocuts are dynamic, with strong shapes and lines. She’s also excellent at characterization. Wong and Chodos-Irvine know how to use space effectively to tell a great story. This series is inspired by classic Greek myths and each book teaches a simple but important lesson. In this one, Pandora just…can’t…stop herself from touching her mom’s big green box. Will her curiosity get the better of her? One little touch can’t hurt right? The words and sentences are very simple and to the point; perfect for toddlers and early readers. Holub uses several great verbs like leaning, sitting and bouncing and skillfully crafts a story with just a few key sentences. Last Stop on Market Street is one of the best of 2015. It’s about the relationship between a grandmother and her grandson and what makes it shine is the grandmother’s magic. She’s pure positive energy and has the ability to see beauty in everything. Her wisdom is gentle yet strong enough to open CJ’s young eyes to his world. As they travel through their neighborhood, CJ yearns for what others have but her thoughtful corrections and caring perspective show him just how much he already has. She gives him the gift of positive reflection. There are so many great things working together in this book. Until I sat down to write this review, I valued the story more, but when I slowed down (like CJ) and took time to appreciate the illustrations, I came to love how well they belong with this story. 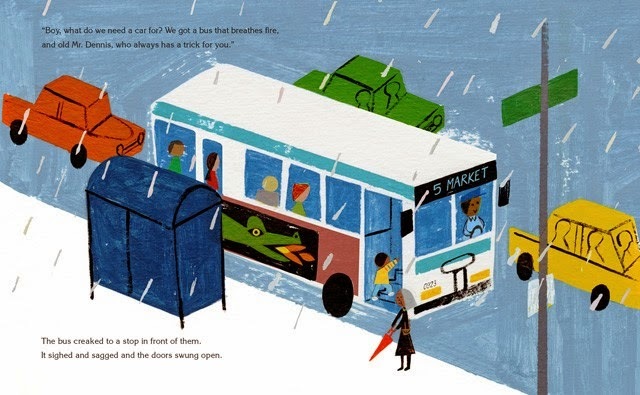 De la Peña’s poetic, rich and descriptive words combined with Robinson’s vibrant, blocky paint and collage illustrations carry the story to its destination. I love the diverse people! I love how they speak in colloquial language! Nana sounds like my grandma and that detail is important; some young readers may connect to this book based on that detail alone. The everyday realness of this story shines brightly; Nana and CJ’s story is a reflection of us, our modern world and all of its amazing colors! Too Many Tamales is a funny and cute Christmas tale. Maria is finally old enough to help her mother prepare tamales for the family Christmas get-together! She’s excited to help her mom but she’s also tempted by her mom’s shiny ring sitting on the table. She slips it on (just for a minute!) to knead the masa for the delicious tamales but it falls off her finger! Her father helps finish the tamales and Maria runs off to play with her cousins as family members slowly arrive. Maria realizes the ring has slipped off her fingers and she corrals her cousins into helping her eat all twenty-four tamales! Bellies full of too many tamales and no ring in sight, she faces her mother, eyes full of tears but ready to confess the truth. Ed Martinez’s oil paintings are warm with dark colors and glowing skin to reflect the lighting of a warm home during winter. The big plate of tamales looks tantalizingly delicious and Martinez pays special attention to the characters’ expressions. I love stories that talk about family, culture and food and this one reminds me of my family’s Christmas get-togethers when I was a child, when I’d run off to play with my cousins. Too Many Tamales has been around since the early 90s so perhaps many families have grown up with this cute story of a Mexican-American family during Christmas. If you read this book, maybe you’ll be inspired to make tamales for Christmas. Mmmm delicious. Just don’t lose your ring in the masa like Maria! In Bernice Gets Carried Away, Bernice gets carried away and gets carried away! Bernice is in a bad mood and she’s not ashamed about it one bit! Even though she’s at a party, everything is going wrong for her; she doesn’t get a frosting rose on her cake slice, she gets a nasty warm soda and she doesn’t even get to hit the piñata before some big kid bursts it open. It’s just a bad day overall. Suddenly she spots the balloons and decides to make her day better by snatching them before anyone else can but they carry her up up and away! While dangling in the storm clouds, she realizes that it’s better to be nice and her generosity makes her a little lighter. The illustrations in Bernice Gets Carried Away are gorgeous. Very detailed acrylic paintings accompany the story. From the whiskers on Fox’s face to the tiny details in Bernice’s annoyed expressions, the art is beautiful. Harrison’s use of color is also great; it ranges from gloomy gray hues to a bright, spring pastel palette. The lesson to take away from this book is, it’s okay to be grumpy sometimes (we all have our days) but it’s important to remember to care for others and not get carried away! This beautifully illustrated and written fable has the potential to be a new classic. It is gorgeous and the story flows with steady confidence and a quiet voice. Little fox lives alone and gains strength from the star he sees every night. The star is his friend, guides him through life and is his world. But one night his star disappears and everything changes; the poor fox is lost without his dear star. He burrows deep in his den and is almost overtaken by the creeping darkness but…overcomes it. He ventures out to explore the world again. At one point he rests and wakes to find his world changed again, but will he ever find his star? The Fox and the Star’s illustrations are exquisite. As soon as you pick up the book, feel the cloth-bound cover and look at the intricate design, you know that you’re in for a treat. The story and the art are well suited. Coralie Bickford-Smith tells Fox’s story through careful words and detailed screen-printed illustrations. There are only a handful of colors used in the book but they make the images very striking. If you appreciate great storytelling and beautiful illustrations, add this book to your collection.